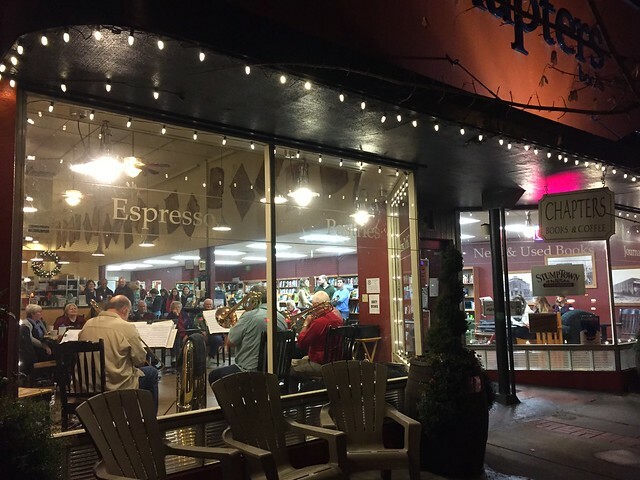 Last year NFC Brass and a trombone quartet (seen above through the window) played several sets of Christmas music at Chapters Books. This year the same group played as Newberg Brass. Their different name and the location of their rehearsals are the only changes to this group brought about by Mauri’s retirement. They still rehearse every Tuesday evening—in fact I can hear them playing in our living room as I write this because they needed to use the piano. Normally they cram themselves into the recording studio. I’m enjoying the “intrusion” tonight because I can’t normally hear them. They’re prepping to participate in two worship services in a church down in Salem on Sunday morning. Maybe I’ll take my camera. We were fortunate enough to be here for this last year, wish we could have repeated that this year! Can’t wait to hear how it goes in Salem!